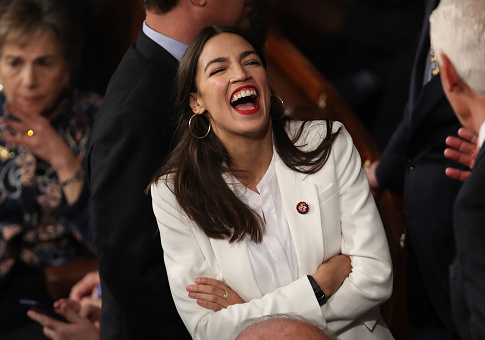 Framers of the "Green New Deal" released an overview of their attempt to drastically overhaul the U.S. economy and energy system, which included guaranteeing economic security for those "unwilling to work." Championed by Rep. Alexandria Ocasio-Cortez (D., N.Y.), the "Green New Deal" is likened to the goal set in the early 1960s by President John F. Kennedy for the U.S. to reach the moon. Its ultimate goal is "meeting 100 percent of the power demand in the United States through clean, renewable, and zero-emission energy sources," and a complete transition away from fossil fuels and nuclear energy sources. An overview document released Tuesday by Ocasio-Cortez's office, which contains numerous typos, laid out what the Green New Deal sets out to do. Proposals and promises include "economic security for all who are unable or unwilling to work." The Free Beacon has more details on the outline of the Democratic proposal here. Ocasio-Cortez told NPR she had "no problem" saying that such an overhaul would be require "massive government intervention." "One reason that people are politically conservative are skeptical of efforts to combat climate change is that it sounds to them like it requires massive government intervention, which they just don’t like," host Steve Inskeep asked. "Are you prepared to put on that table that, ‘Yes actually they’re right, what this requires is massive government intervention?'" "It does, it does, yeah, I have no problem saying that," Ocasio-Cortez said. "Why? Because we have tried their approach for 40 years. For 40 years we have tried to let the private sector take care of this. They said, ‘We got this, we can do this, the forces of the market are going to force us to innovate.’"
With regards to how to pay for the project, which NPR acknowledges is likely prohibitive at trillions and trillions of dollars, the FAQ document states, "The Federal Reserve can extend credit to power these projects and investments and new public banks can be created to extend credit." This entry was posted in Issues and tagged Alexandria Ocasio-Cortez, Climate Change, Green Energy, NPR. Bookmark the permalink.